Sava Hotels Bled merges a modern business climate and diversity in harmony with nature. The hotel conference centre with facilities in 6 hotels offers everything you need for the perfect execution of a business event with an environmentally-friendly note. The amenities range from a broad selection of state-of-the-art conference facilities to restaurants, bars and shops featuring a top-level culinary offer. Among the 26 different conference spaces, you are sure to find the one that will give your business event a unique feel in the embrace of the creative atmosphere of Lake Bled. Bled Island, the Vintgar Gorge and the Triglav National Park are just a few of the numerous natural treasures to discover in the immediate vicinity. The optimum layout of hotel buildings and conference centres located nearby allowing you to walk to the venues and enjoy the fresh air, beautiful vistas and the slow pace of the town. Bled is a pleasant destination with a distinct creative charge, a preserved environment and a focus on a healthy "green" way of life. Bled is home to one of the first institutions for the development of management, which grew over 25 years and developed into an innovative international business school and received numerous international awards. 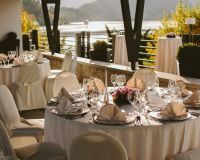 The Sava Hotels Bled conference centre has a comprehensive offer of hotel, congress, catering, golf and wellness services of the highest quality. When you decide on a business event at Bled, you can rest assured that your choice is a green one and will let your guests know that your excellence transcends into the sphere of social responsibility. 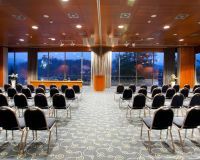 The conference facilities at Sava Hotels Bled are illuminated by natural light as much as possible. The temperature in the halls is adjusted to the natural conditions, which is why it is lower by a few degrees in winter and a few degrees higher in the summer. The climate in the halls is, of course, always comfortable ensuring that the participants feel good and are able to focus and actively participate in the event. The care for the environment begins with ourselves. At Sava Hotels Bled, we recycle half of our waste annually and reduce the consumption of energy products and water with every passing year. When selecting vendors, we favour domestic providers and develop products that protect the environment and build the awareness of our guests about environmental issues. These include the nearly carbon-neutral natural water and the product line named "Green for a Better Tomorrow". Learn the basics of rowing under the guidance of Slovenian Olympic athletes. Take your team on a journey of discovery of the importance of balance between an individual's strength and team coordination for the attainment of a common goal. You will be surrounded by a wonderful and inspiring landscape throughout your journey. Discover the magical Bled and its surroundings in a "green" way. Visit Bled Island on a traditional "pletna" boat, discover the hidden corners of the town on a distinctive horse-drawn carriage or grab a bicycle and cycle the picturesque path along the Sava Bohinjka River up to Lake Bohinj. Merge the active discovery of the hidden gems of Lake Bled with the culinary pampering of your guests. The menu comprises 4 stages around the lake showing you the local culinary delicacies. Green mobility and culinary superlatives merged into a single experience. Venture into nature by taking a soothing hike along the Rikli trails. Discover the effects of their healing methods and try a healthy and tasty lunch in the idyllic glamping site with an amazing view of Bled. You cannot leave Bled without trying the iconic cream cake. Listen to the story behind the popular dessert and see how it is made. In the end, you must, of course, enjoy the heavenly taste of the delicious cream cake.